“Constructive journalism deconstructs news, reframing reporting to highlight solutions not just problems. Highly recommended for disillusioned hacks (including me)!”, said one of our recent freelance workshop participants. 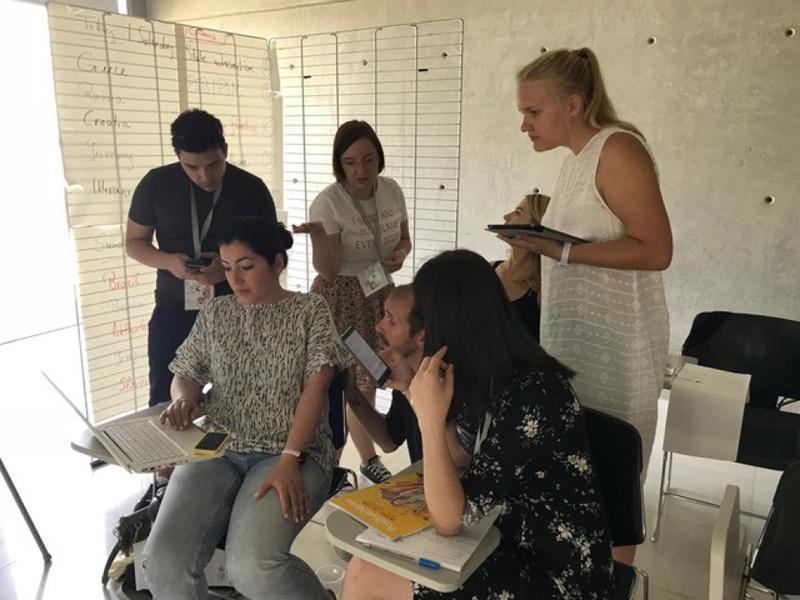 “It has generated ongoing discussion about the concept of a constructive approach to news stories… We will embed this into our practice”, wrote a journalism college programme leader. For most people, December is a time of reflection on the year past. For us, it is March, as it is a year this week since we started our first-ever university tour. In the past twelve months, we have been travelling the UK and beyond to deliver courses in constructive journalism. We worked with the University of Southampton, which was awarded funding by the Impact Acceleration programme at the Economic and Social Research Council to disseminate the findings of research into the impact of the news, conducted by Dr Denise Baden and colleagues. We taught hundreds of students from Scotland to north Wales and the east coast of England, and went from Germany to Ireland and Italy to work with media professionals in newsrooms, too. Next month, we’ll wrap up the university tour after more than twenty visits and overwhelmingly positive feedback from both students and professors. We’ll take some time to evaluate the tour and hope to be back with a second round in the next academic year. Meanwhile, at our headquarters in London, we welcomed dozens of freelancers to not just practice constructive journalism, but make a living from it. 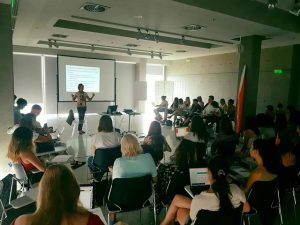 The one-day course has been attended by journalists across countries, platforms and age groups, with many currently working on their own constructive journalism ventures in Europe. The next workshop is announced for Friday 15 July and booking is now open to all, on a first-come, first-served basis. And industry media increasingly know where to find us when covering the constructive journalism movement. 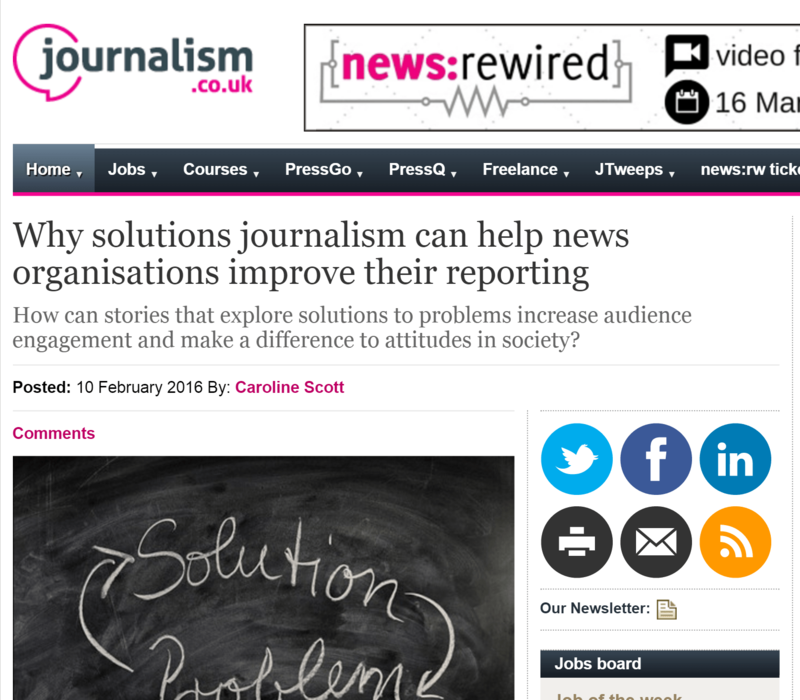 Journalism.co.uk recently featured us again in a podcast: ‘Why solutions journalism can help news organisations improve their reporting’, and the World Association of Newspapers zoomed in on our latest constructive journalism magazine experiences. BBC Radio Ulster also paid attention to our work (listen back from 1:25:00) and many bloggers find their way to us too, including under the header ‘What Now For News’ on the Huffington Post. As the momentum for more constructive news keeps building, we hope you join us in changing the conversation. You can connect with us on Twitter, Facebook or via our newsletter, and of course face-to-face. To find out where we are next, keep an eye on our schedule here. During our popular one-day interactive workshop, we cover both the academic theory and editorial practicalities of constructive journalism. The next workshop is on Friday 9 October 2015, from 10am-5pm in The Biscuit Factory in London. Participants have joined us from all around the world, so if you need travel or accommodation assistance, just email us and we’re happy to help. The workshop is suitable for both independent and staff journalists, as well as those working in related media or communications fields. You will gain tools and techniques to report in a way that empowers your readers, listeners or viewers. You learn exactly how constructive journalism engages people and how you can make it a sustainable practice within your business or organisation. We introduce you to editors looking for constructive storytelling and you’ll hear from experienced freelance journalists who share their top tips for earning an income from constructive journalism. If you want to use your journalism to really make a positive difference to your audiences and the world, then this workshop is for you. Spaces are limited to allow for plenty of one-to-one attention. You can reserve your place online here. After travelling to Perugia, Italy to deliver a session on constructive journalism at the renowned International Journalism Festival, we’re pleased to announced that our next stop will be London. Join us on Friday 12 June for a thorough introduction to this growing domain within journalism globally. It will be a full day course (and tickets include lunch, refreshments and homemade cake! ), packed with theoretical background as well as many practical tools and exercises to pitch and produce constructive journalism. The workshop takes place at London’s centrally located Biscuit Factory (near London Bridge and Bermondsey). If you want to join our next workshop on 12th June in London, you can book directly online. Participants join us from all around the world, so if you need any cheap hotel recommendations for nearby places, email us and we’re happy to assist. We also have a few discounted bursary placements available for participants who are unable to pay the fee. Email us at info [at] constructivejournalism.org to apply. Places are limited to allow for plenty of one-to-one attention and tickets are sold on a first come, first served basis. Our next day course has been scheduled for Friday 20 March 2015 in London. For those who can’t wait to join: we offer a 20% earlybird discount if you book by the end of the month. We’re limiting places to allow for plenty of one-to-one attention. As we like to use the pay-it-forward philosophy in everything we do, we offer assistance to those who cannot afford our courses. If you are a student, unemployed or on a low income, please contact us to see if we can assist you with a bursary place. A new year, full of new opportunities for the Constructive Journalism Project. We’ve got exciting plans to help grow the field of constructive journalism in the UK and beyond, and will keep you posted via this page as we go. In November we successfully ran the UK’s first ever Constructive Journalism introductory workshop. A group of journalists, communications professionals and students all learned how to create and sell quality pieces of writing with constructive angles. We were chuffed with the feedback we received from the pioneers who joined us at the Biscuit Factory. 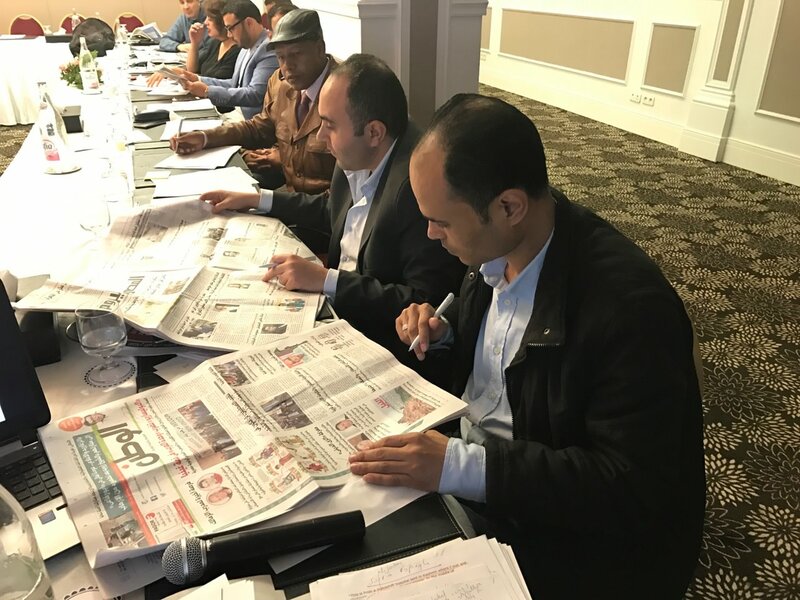 “After ten years as a journalist, this workshop has reinvigorated my passion to use my writing to making a difference, and has given me the tools to challenge the negative news agenda in a sustainable way”, one participant said. We truly hope to be working with many more like-minded journalist in coming months. Alongside organising workshops, we are in constant contact with organisations and individuals working in the field of constructive journalism around the world. During our last workshop, we had a guest appearance from Keith Hammonds of the Solutions Journalism Network in the US, and BBC Radio 4 even came along to record us. The programme will air next month: we will of course keep you posted!